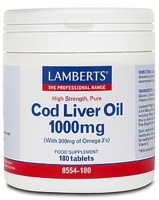 Cod liver oil is a nutritional supplement derived from liver of cod fish. As with most fish oils, it has high levels of the omega-3 fatty acids, EPA and DHA. Cod liver oil also contains vitamin A and vitamin D. See also "Cod Liver Oil health supplements during pregnancy and lactation may improve children's IQ." Vitamin A and D necessary to support bones, teeth and vision. Cod liver oil is a nutritional supplement derived from liver of cod fish. As with most fish oils, it has high levels of the omega-3 fatty acids, EPA and DHA. Cod liver oil also contains vitamin A and vitamin D. It has historically been taken because of its vitamin A and vitamin D content. It was once commonly given to children, because vitamin D has been shown to prevent rickets and other symptoms of vitamin D deficiency. Cod liver oil is widely taken to ease the pain and joint stiffness associated with arthritis. It may have a positive effect on heart, bone, as well as helping to repair wounded skin, hair, nails, and teeth. Cod liver oil and fish oil are similar, but cod liver oil has higher levels of vitamins A and D. According to the USDA, a tablespoon of cod liver oil (13.6 g) contains 4080 μg of retinol (vitamin A) and 34 μg of vitamin D. The Recommended Dietary Allowance of vitamin A is 900 μg per day for adult men and 700 for women, while that for vitamin D is 15 μg per day. The "tolerable upper intake levels" are 3000 μg/day and 100 μg/day respectively, so people consuming cod liver oil as a source of omega-3 fatty acids should pay attention to how much vitamin A and vitamin D this adds to their diet. Cod liver oil may be an effective complementary measure for long-term treatment of multiple sclerosis. Use of cod liver oil during pregnancy is associated with lower risk of Type I diabetes in the offspring. (although see adverse effects). This effect was found only in mothers taking cod liver oil, not in mothers taking multivitamin supplements. Cod liver oil taken by nursing mothers improves the breast milk by increasing the amount of fatty acids, which promotes brain development, and the amount of vitamin A, which helps prevent infections, but the level of vitamin D is unchanged. A Norwegian study of more than 68,000 women reported that female cancer patients who took daily cod-liver oil supplements had significantly reduced mortality (25% for all cancers, 45% for lung cancer) compared to women who did not take such supplements.